Ahhhhhh, where to start. I think it's safe to say that, despite a very unorthodox tapering period, this race was perfect in every, single way. I loved it. 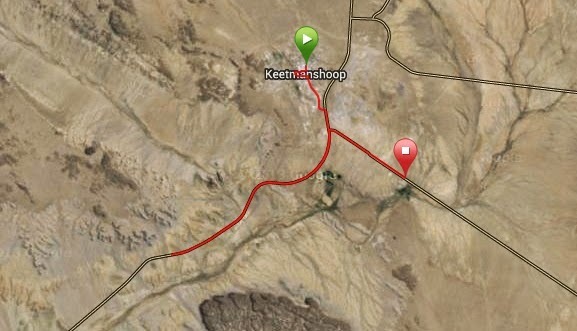 After a teeth-chattering start, where I regretted my decision to not wear a warm top for the race at least two dozen times, we were off from the Keetmanshoop Nedbank in the direction of Luderitz. All the race distances started together (it was a smallish race), turning the first few kilometres into a delightful shambles of giggling, barefoot children; sleek, serious athletes; and a poor European guy who couldn't understand a word of what the announcer was saying. I was in heaven. From my Garmin download. It was COLD. My goal for this race was simple: I wanted to PR. And just like with every, single long training run that I did in preparation for the race, the race itself had a sense of "now or never" written all over it. I knew all too well that logistics wouldn't allow me to train for another half-marathon (or half-marathon PR attempt) again anytime soon: Will will start training for his goal cycle race in March soon, and doing an 18 km long run with two kiddos in a double stroller is just no-one's idea of fun, least of all the poor passengers. So I had one shot and one shot only at setting a new PR. I decided beforehand that I would try to run each 5 km segment of the race in more-or-less 27 minutes. That would allow me enough time to finish the remaining 1.1 km before reaching my current half-marathon PR time of 01:59:27, and still give me a tiny bit of breathing space in case one of the 5 km sections didn't go exactly as planned. I'm pretty sure that my face was frozen in a determined grin for the largest part of the race, ha! The first 5 km went right according to plan: 27 Minutes on the dot. And despite the slight headwind; a severely slanted road; and a brief encounter with a bundle of wires, I was feeling great. Second 5 km: 27 Minutes on the dot again. Woohoooo! I skipped the first two water tables (at 3.5 km and 7 km, respectively), because I saw nothing but Coke available to drink (I hate Coke!) and must say that I was getting just a tad concerned about the whole hydration situation at that point. I knew that I had to drink something at the turnaround point (11.05 km), whatever was on offer, if I didn't want to ruin my own chances at a PR. The turnaround point was a very chilled affair: I wanted so badly to just grab my turnaround sticker (proof that runners ran the whole course), chug down some water and get out of there, but alas. The sticker guy started to fiddle with his papers and stickers for what seemed like an eternity before handing me my sticker (in reality it must have only been seconds, ha! And I'm pretty sure I trippled around on the spot like a little kid...) and although there was water available, none of the cups placed out on the table had water in it - it was just Coke as far as the eye could see. Argh! Anyway, I grabbed a cup of Coke, thanked them for my sticker, and was off. I had a 27 minute 5 km to run, darn it! One thing that I did like about the turnaround point, was the fact that it allowed me to see my placing: 5th women on the course - ooooooooh! And just like that an additional race goal was born: I wanted to PR and I wanted to place. Go big or go home, right? I hit the 15 km mark at 81 minutes - 27 minute 5 km Number 3. But then I got tired. My pace started to drop and I had some major mental battles going on to get the pace back up. The girl in front of me was apparently experiencing exactly the same thing - except that she started taking walking breaks and I soon passed her. Fourth woman on the course - whoop! At 3 km to go I crested the final uphill, picked up speed, and passed the girl in front of me - podium!! The final water table also had water available - hallelujah! - so I was pumped, hydrated and ready to give my all in that final 3 km. I felt like I was flying over those last 3 kilometres - shamelessly huffing chanting my mantra and thrilled with excitement when Grandpa and Grandma drove past me with the kids on their way to the finish line to meet me. I crossed the line as the third female in a time of 01:56:12 - a PB by 3 minutes and 15 seconds, hooray!! Baby J's first visit to the podium! So, as you can see, my race really was perfect in every, single way. Apart from meeting and exceeding my race goal, running in beautiful Namibia was a feast for the soul. Namibia is so beautiful - do visit if ever you get the chance. Those mountains on the horizon and the tufts of bright yellow grass in the foreground are etched into my memory forever. Well done! That is indeed a perfect race, podium and all. I love Namibia! I love Namibia too - wish we could visit a lot more often! Coke at races is VERY common in our part of the world - I HATE it! How about something that's, uhm, at least just a little good for us...? Apologies for the poor description of the sticker thing. The race wasn't chip-timed, so basically each runner needed to collect a specific sticker at the start and stick it on their race bib (to ensure that you did, in fact, start at the start and not jump into the race somewhere along the course). Each runner had to collect a sticker at the turnaround point too (to ensure that you turned around at the turnaround point and not sooner) and stick it on your race bib. Runners who showed up at the finish line without the two stickers (i.e. runners who didn't run the whole course) weren't eligible for prizes. Sort of like a manual version of chip timing, where you need to run over a certain number of timing mats at certain points to make sure you covered the whole course. Thanks soooooo much, Hailey - I really, really appreciate it and I'm still sooooo excited!! Now the year can end in peace, haha! Isn't it funny how I find it funny that you guys find it funny that we're given Coke at races...? Some races do have Powerade or Energade (thank goodness! ), but A LOT of races down here only offer Coke and water (especially smaller, local races). I never drink Coke, so it's really awful to have to drink it at races. I guess the best thing would be to start running with my own fluids (I usually do long runs with a coconut water/juice mixture), but I also don't like running with a bottle. Argh!